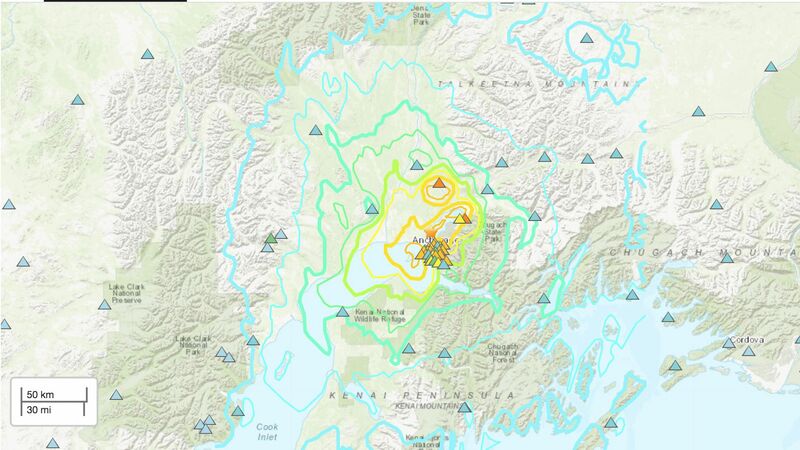 A 7.0 magnitude earthquake has struck just north of Anchorage, Alaska, shaking buildings, cracking roads and pausing air traffic into the state's busiest airport. According to the U.S. Geological Survey, at least 277,000 people felt "strong" shaking from this quake. What's new: The tsunami warning for the Cook Inlet and the southern Kenai Peninsula has expired. There are widespread reports of power outages and cell phone disruptions in the Anchorage area. The Federal Aviation Administration issued a nationwide ground stop to Anchorage, which will hold flights at their originating airports. "There is major infrastructure damage across Anchorage. Many homes and buildings are damaged. Many roads and bridges are closed. Stay off the roads if you don’t need to drive. Seek a safe shelter. Check on your surroundings and loved ones, " according to Anchorage police. President Trump tweeted encouraging residents to follow directions to officials and that the federal government "will spare not expense."